One of the pleasures of the pre-digital world was printing from my b+w negatives in my home darkroom. 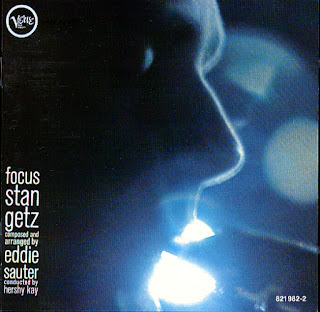 There was nothing better than to go down with good negatives, mix a batch of chemicals, put a record or tape of Stan Getz Focus (Verve 42282 19822) and light up a pipe. I ignored all who told me that smoking a pipe was only marginally less bad than smoking cigarettes. By 2 in the morning (I liked to print late at night) I would sometimes get very dizzy with the smoking in my poorly ventilated darkroom. I would get so dizzy that I would vow I was never going to smoke a pipe again. By breakfast I was already changing my mind. Sometime around 1994 I suddenly lost interest in smoking. I would smoke the odd cigar and finally narrowed it down to smoking one cigar (walking around the block while doing it) on New Year's Eve. Then I stopped completely. I gave my beautiful pipe cabinet and last large glass container of Edgeworth pipe tobacco to my son-in-law Bruce Stewart and packed my pipes away since I did not have the heart to throw them away. I have quite a few. The logic of having a large pipe collection is as follows. I usually smoked about 5 pipes a day. If you multiplied that times 7 days in a week the figure is 35. That means that you need a minimum of 35 pipes if each pipe will rest for a week. By resting a pipe you allowed the wood to absorb all the liquids that made smoking the same pipe over and over an upleasant and bitter experience. 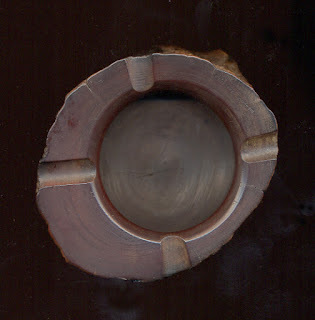 This means that I have about 45 pipes including some specialty pipes (like the Filipino one with the long stem as seen above). The Filipino pipe was one I smoked while sitting since it was heavy. The odd shaped pipe with the aluminum band was a pre (1888) opium pipe. This is when Charles Martin Hall discovered a cheaper way of smelting aluminum. Before then the metal was most precious and even Queen Victoria had aluminum flatware. I liked to take this pipe to the theatre or to concerts as its small bore bowl packed just enough tobacco for a short intermission. I smoked it at the Old Vic when Rosemary and I went to see Deborah Kerr in The Corn is Green (the show was terrible and we fell asleep). 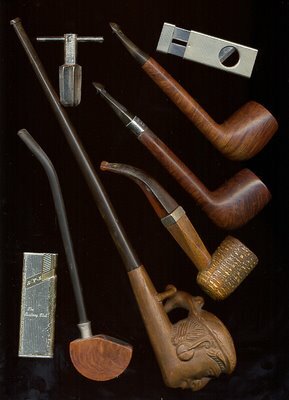 My favourite pipes were the Dublin-made Peterson's. The mid-priced ones were called Kapets and my favourite shape (there are two in the picture above) was the Canadian which featured a long oval-shaped shank. I have about 10 of them. When my mother returned to Mexico from visiting her brother Tony in North Carolina she brought me the Missouri Meerschaum (corn cob) pipe. With it she gave me a couple of packages of a very sweet pipe tobacco from Sweden called Borkum Riff. In the picture is a pipe reamer and a brass cigar tip cutter. The gas lighter was given to me by John Lekich many years ago as a memento of our Railway Club tertulia. I don't miss my pipe smoking but there are moments when I print my b+w negatives (I still do this) that I feel like listening to some Stan Getz and smoking a pipe. But that moment is fleeting as I wonder after 40 odd years of inhaling darkroom chemicals and specially selenium toner if somehow tobacco was the lesser of the evils? Also here are what were my two favourite ashtrays. The ceramic one I used for my cigars. 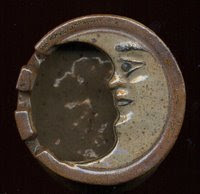 It was was made by Ken Edwards in Tonalá, Mexico. The quebracho (a very hard wood from a tree that grows in northern Argentina) ash tray is where I tapped my pipes to empty the dottle which is a bit of unburned tobacco and ash that collects at the bottom of the bowl.